A senior Boehner political aide tells CNN that the ad is intended to rev up the Republican base in an election season, that as of now, appears to favor the GOP. "Republicans have a big opportunity in 2014, and the Speaker wants to make the most of it. With no significant statewide primary to mobilize and engage voters in Ohio, we're stepping up and doing our part to build a strong foundation for victory up and down the ticket in November," said campaign spokesman Cory Firtz. There's no U.S. Senate contest in Ohio this year, and so far Republican Gov. John Kasich's re-election bid hasn't captured much of the media spotlight. The TV ad is the first by Boehner since the 2010 primaries, when he easily defeated a bunch of primary challengers. That November, thanks to a historic 63-seat pick up, the GOP captured the House from the Democrats, with Boehner becoming Speaker. This year, Boehner once again faces multiple challengers in the May 6 primary, including one with support from tea party activists. But the Speaker is expected to easily win re-nomination. In the general election, Boehner was unopposed in 2012, and has grabbed at least 61% of the vote in each of his 12 congressional election victories. Democrats need a net gain of 17 seats this November to win back control of the Republican-led House, a feat political handicappers say is unlikely in part due to the shrinking number of competitive congressional districts. "Boehner does what he hasn't done in four years"
As the head of the very worst, least productive, most partisan Congress in American history, it is no shock that Mr. Boehner needs to run ads. With his level of effectiveness his constituents probably thought he was dead. I would say put in 2 hours of work. What a worthless tool. GOP thought that they had big opportunities in 2012 and 2013 too. They never see it coming. That's the beauty of seeing them in SHOCK. Don't say it was something intelligent. It couldn't be, could it? House Speaker John Boehner is doing something he hasn't done since 2010 – he's running campaign commercials. House Speaker John Boehner is doing something he hasn't done since 2010 – he's running for his political life. Maybe he's facing a challenge or feels that people don't know him anymore without a tear in his eye. Could it be he senses a disturbance in the force? No, no Luke. Say it ain't so. What, do his job and stop tanning!!! He came up with an idea? I will with all the other millions Americans that you have denied unemployment and their friend and their friend will not be voting for you or any other republican. This is we the people speaking. Americans pay your salary and put food on your table. Pay for your 100.00 dollars hairs cuts. Giving tax breaks to the rich. Millions of dollars to other countries. You turn your back on millions of Americans that pay your salary. This is the first time in my life I hang my head to be an American. I am 53 years old never ask the government for help or a hand out. I have worked for 37 years since I was taxable. Today I have been out of unemployment since 2-3-2014. I am on the brink of losing everything. I cashed my 401K and paid double tax on that income. Which I am sure you received a chuck. Used all my savings. I have nothing left. I have my resume out to 100's of employers. I went on an interview with 55 others for the same position. Feeling sick to my stomach knowing that each of us need the job. So, in that note I will never ever vote for you or any other REPUBLICAN again. As all my family and friend will NOT VOTE FOR YOU... Since, I can not found a job my job now is the RALLY to GET YOU OUT OF OFFICE. Looks as if you have more than 2 million unemployed Americans that have time to rally NO MORE BOEHNER send him and the rest of the REPUBLICANS packing. This can not happen soon enough..
Golfing or raising money. Why you got a problem with that? Who cares. I'm not running again. I'm just in it for the taxpayer paid vacations at this point. @President Messiah Darkness – Golfing or raising money. Why you got a problem with that? Who cares. I'm not running again. I'm just in it for the taxpayer paid vacations at this point. He could vacation for the next 6 months and still be about 100 days short of the number of days his predecessor took. Yeah, we can just ignore the little inconveniences like FACTS!! Get out the Vote Enough of these clowns. Wait wait...I got it: he told the truth? The President is doing the best he can Linda through executive orders. Congress isn't sending him anything to sign. Just more votes to repeal the ACA which is only done to keep the rabid base of the Republicans happy. 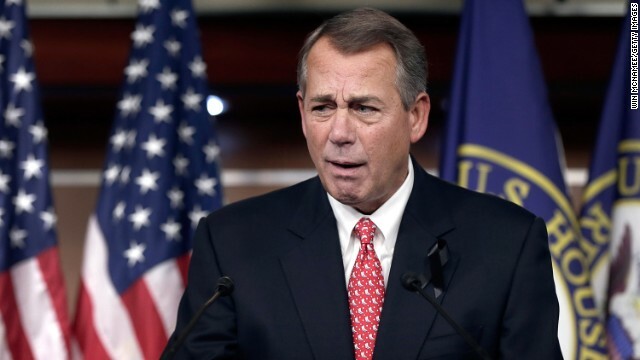 Boehner does what he hasn't done in four years – his job? Can't wait to see Sheldon Adelson,Grover Norquist and the GOP stuff Jeb Bush down the tea party's throats 2012 Mitt Romney style.